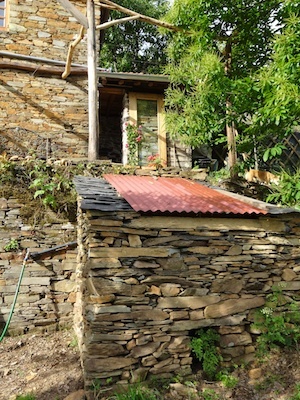 Last year I wrote about our installation of a vermicomposting flush toilet – a worm composting system for a conventional flush toilet – in the outhouse for the wee house. It was all ready and set to go for a good while, minus the worms, but we couldn’t start using it until we had a water supply to the wee house since there would be nothing to flush with until we did. To ready the tank for its purpose, I filled it half way with a large amount of pine woodshavings, dead bracken and leaf litter, layered in that order from bottom to top. I then added a 50-litre bucket of partially-processed compost from the compost heaps, along with some fresh kitchen scraps. I also filled the growing bed with wood shavings to a depth of about half a metre. About the third of a tonne in all. This is to provide an organic sponge and carbon reserve for the liquid draining from the tank and was a great way to use all the shavings from the timber-framed grey water-processing greenhouse we are building the other side of the quinta. On top of the shavings, I laid a branching system of 40mm waste pipe, drilled at regular intervals and sloping slightly downhill to allow the liquids draining from the tank to spread evenly through the shavings. The pipes were loosely wrapped in horticultural fleece to prevent clogging of the holes by the shavings. More shavings were laid on top of the pipes, then the bed was backfilled with topsoil and planted with a lemon tree. More nitrogen-loving plants will follow. The plan was to get the initial worm population from a friend’s piles of horse manure – the last time I collected some manure from them, the piles had been full of tiger worms (Eisenia foetida). Not so in February. I found only half a dozen or so in the cold, rain-soaked heaps, so the only option was to buy some online. With the Portuguese mail service being what it is, I was a bit concerned about this option, but I ordered a kilo of tiger worms from a UK worm supplier and crossed everything I could cross that they’d be OK. It took 10 days for them to get here. They arrived sluggish and slow, but at least most of them appeared to be still alive. Just. I emptied them into the worm bin and left them a week to recover and feed before starting to use the toilet. The section we removed from the top of the IBC tank fits neatly back into place before being covered with a sheet of polystyrene to help keep the worms within their preferred temperature range of 13-27°C. The hinged metal roof is also insulated with polystyrene on the underside. November 2016 The toilet has been working for 2 years now. It’s generated a lot of interest. My local municipality are planning to install vermicomposting units based on this system in local villages. The first was commissioned in July 2016. You can now legally use this method of sewage processing in this region. I have also created a new website with full details of the system, it’s design, construction, maintenance, and more besides, including a forum. The aim is for the site to become a repository of community-sourced experience with installing and operating this system. Great work guys. We are impressed. We have used the dry toilet system but may try this method as well :). Thank you much and hope to stay in touch by viewing your progress :). wow, I’m so impressed. you’re awesome W! Hi, thank you for this post. It is very informative and I will be doing something similar. I have 2 questions please. 1. Regarding the green filter bed. I have 1 mature and 4 less mature wattle trees in the way of where the filter bed will be. My choices are to cut down the trees, remove roots and dig the new filter bed (not preferred option). Or, leave the trees and somehow dig around them without disturbing the root systems so the trees can be part of the filter process. Any recommendations? 2. Your IBC came with a gate valve at the bottom outlet. Are you using this? if so, how are you stopping it from clogging from the inside with all the pine shavings being in the tank ? 1. I’m no expert on this subject, but if it were me I’d probably include the trees as part of the green filter process. Wattles are nitrogen fixers and primary colonisers and the only one I have any experience of is Acacia dealbata which tends to grow in very poor dry soil here, so not sure how they’d react to a very nitrogen-rich environment? But maybe if you interplant with a lot of heavy feeders you can balance that out a bit? A lot of this is experimentation and finding out what works best in the unique environment of your site. 2. I use a bit of plastic mesh on the inside of the IBC tank across the outlet to stop the bottom valve clogging up with the shavings and leaves. Seems to be working fine so far. Thank you for your response which seems like good sense. I will leave the trees and interplant as suggested. Monitor and review. Dear Friends – I am so happy to stumble upon your site, and to see that you have adopted my composting flushtoilet design – and you’ve obviously done a GREAT job of it. How wonderful!!! Thank you so much for spreading the word and the info. I now have a new book out: “Green Light at the End of the Tunnel” – and it has just about all of the Solviva designs in it, including the Solviva Composting Flushtoilet, all drawn to scale and with hundreds of numbered detailed descriptions. I’ve now had mine going constantly for more than 20 years without any odors, flies, clogging, freeze-up or other problems – it is reducing nitrogen pollution into the groundwater by better than 90%, which is truly awesome! I would love to hear a latest update about yours. Have you had any problems? Have others emulated you? I’d love to hear from you, and stay in touch. With very best wishes to you all. Hello Anna! How wonderful you found this! I did actually write to you about it, but maybe the email never got through. One year on, the toilet is working brilliantly and it seems the more compost builds up in the container, the better it performs. I’ve had no problems at all. I haven’t heard from anyone emulating this yet, but a lot of people have told me they plan to. Better yet perhaps, I’m currently working with our local council to replace the village septic tanks in this area with your system. The council have approved, in principle and subject to further permissions and detailed plans, the installation of a pilot project where a septic tank has been spilling out directly into the environment. I initially planned to propose we did something like you did at the Black Dog Tavern – treating the effluent exiting from the septic tank – as I thought this might be the easier option to get approval for, but our local presidente suggested we converted the entire system and this is what the council have agreed to. We are drawing up designs to re-engineer the septic tanks into vermicomposting chambers and I’m working with a Portuguese architect on the detailed plans and proposal as we speak, so your message is great timing! If you’d like to work with us in any way, please get in touch! You can reach me at info@permaculturinginportugal.net. The next step is to get approval from the ICNF (Instituto da Conservação da Natureza e das Florestas) as this is a protected landscape. Once we have that, we are good to go! Since my last post in early April, I have built my system largely based on the information you have kindly shared. I too had trouble reaching Anna but I used the email address on her website which must be spammed regularly so no surprise. Thank you to all. My system is working marvellously after 3 months. I cannot believe how there is zero smell or flies. Its absolutely fantastic. I only wish I had known about this 4 years ago when we came into the bush as we spent a considerable sum of money on composting toilets which I DO NOT miss! Great news Neil! Maybe we should start a forum or something for people who’ve built Anna’s toilets?! It would be brilliant to compare experiences and collect data! So glad it’s working just as well for you. 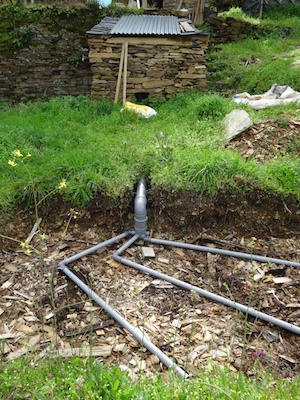 Well it was never going to be that simple … We heard on Thursday that the câmara municipal of Arganil have backtracked and decided against installing the vermicomposting system proposed by myself and a local architect as a solution to a local village septic tank problem and are putting in a compact ETAR. The reason for this is the supremest of ironies. The ICNF (Instituto da Conservação da Natureza e das Florestas) – ie. the agency charged with environmental conservation and who are responsible for the protected landscape in which the village septic tank is situated – are being “difficult”. However all is not lost. The câmara are still keen on the idea, as is our local presidente da junta de freguesia. So the plan has simply shifted location to somewhere outside the ICNF’s jurisdiction. 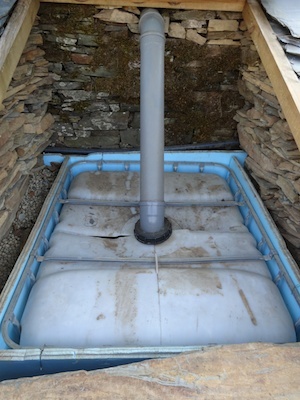 Four households in another village (one without a centralised septic system) have had problems for some time with their sewage disposal so in September we will make a new proposal for a worm system there. There are also other similar situations within the freguesia which can be considered. Nice job you done there! After reading about how careful you were isolating the IBC to keep the worms alive one question came to my mind. If there’s no oxygenation inside the tank, then there is an anaerobic process going on inside, an anaerobic environment is deadly to most forms of life. This said I wonder if you ever checked your worms again? Also, an anaerobic process releases heat, the worms might be cooked by now? Do you have any picture of the inside of the tank? I’m curious about how the wood is disposed and the water level. Regarding the output of the tank, you covered the pipes with topsoil and planted a tree. Gravel instead of topsoil is usually used for a good reason, the chances of clogging are minor, the drainage is much better and takes much longer until the soil is saturated. Plus, with topsoil there’s a high risk of having roots going inside the each hole of the pipes clogging it. I feel my comment is too negative… Hope you take my criticism as a good thing for your project. I just came across you site and spent hours reading every post, the ideas, projects and the flow of the work being developed is fantastic. Would love to visit one day. Thanks for your comments. I’m always happy to answer criticisms of the system, but it seems there are a few misunderstandings and misconceptions of how it works here. Maybe I wasn’t very clear in my descriptions. There’s insulation around the tank to keep the worms at a comfortable temperature, but the top of the tank isn’t sealed and air can still pass easily. So although there’s no forced airflow in and out of the container, there’s no shortage of air so there’s no possibility of the system becoming anaerobic under normal conditions of use. Actually it’s aerobic decomposition that creates heat, not anaerobic – it’s the oxidation (= combustion) of materials which creates heat. 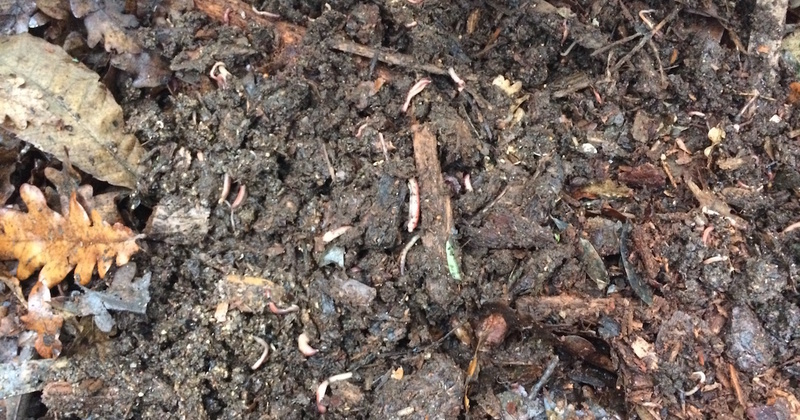 Are you thinking of how a compost heap heats up in wondering about whether the worms will be cooked? In a compost heap, the heat is primarily due to the rapid bacterial breakdown of the fresh green vegetative material in the heap. There’s no fresh green material in this system. The breakdown of the woody material is much slower and results in far less heat being built up. There’s no water in the tank. It percolates straight through the vermicompost, wood shavings, leaves, etc, and leaves the tank for the “greenfilter” bed. As mentioned in the description of the system, it’s necessary to make periodic additions of woody materials so I check the tank every 6 months or so. The worms are thriving. They’re about twice the size of the ones I started the system with and they’ve multiplied to fill the entire top layer of the tank. I would estimate there are now around 20kg of worms. The system was started with 1kg. That says to me they’re pretty happy in there! It’s incredible how they can reduce over half a cubic metre of coarse wood shavings, dried leaves, bracken, etc, to just a few centimetres of rich compost inside 6 months. Effectively, there’s continual monitoring of the system going on because if anything were to go wrong, turn anaerobic, etc, you would very quickly know by the smell. The worm tank is immediately below our dining area. There’s no smell whatsoever. The perforated pipes in the “greenfilter” bed are not in contact with the topsoil. As shown in the images, they were wrapped in horticultural fleece and then covered in a thick layer of wood shavings before the topsoil was added. The idea here is to hold the outflow of the tank in the bed, not to drain it away. The wood shavings used were of a wide range of sizes – some more chunks than shavings – so initially they perform somewhat similarly to gravel. Once they break down, they act more like a sponge. This is preferable because it absorbs and holds the fluids from the tank and makes them available for anything grown in the bed. Because the woody material acts like a sponge, the moisture is well distributed and tree roots have little incentive to aim for the perforations in the pipes. Soil rich in organic matter behaves very differently to soil with minimal quantities of it. I hope that makes the system a bit clearer to you now. The original system designed by Anna Edey has been going for over 2 decades now, and as she says in the comments above, with no problems of any sort. I did hear too that she apparently has never had to empty the compost out of the bin as it’s never filled up! Thanks for making the ideas about the IBC design clearer. If there’s oxygen and no water retention then my skepticism goes away, you probably explained it well in your initial post but I didn’t get it. By any chance could you provide some pictures or a link to a system like yours? I would like to understand in more detail how it’s done, the major problem I see is how to ensure all the solids keep retained and only liquid goes to output pipes. If this isn’t well done I believe clogging can happen. Then, how is the finished compost separated from the rest? If the water from the flush passes through the compost then some of it will dissolve in the water and again in might clog the system? Your approach in designing the “greenfilter” is a bit different of the conventional “draining field”. What you say makes sense still I would concern about the saturation of the soil, personally I wouldn’t want to hold too much sewage water in the field, if it gets too wet then it might smell. Anyway, if the system has been running without problems that’s what really matters. There are links in the first post on the vermicomposting toilet to Anna Edey’s site where I got the idea, but here it is again. I think if you could see the system, you’d see very clearly how the solids are retained. They’re falling on a thick bed of organic material which is being continually aerated and turned by the worms with the solids being broken up, eaten and distributed by them. It’s a living system and the faecal solids are its food supply. Nothing is wasted and nothing gets through to cause clogging. This doesn’t behave in any way like a lifeless filtration system where clogging would be anticipated. If things dissolve in the water on the way through, then they’re in solution, so will pass without clogging. It’s suspended particles you would need to be concerned about, but they don’t make it through the organic ‘sponge’ that is the vermicompost and woody material. Not only doesn’t it clog, this system is capable of removing 90% of the dissolved nitrogen in the wastewater in a throughput time of just 10 minutes. 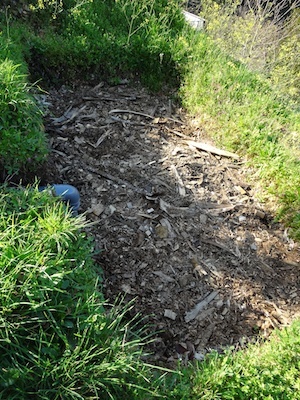 If you want to remove some of the worm compost, it’s relatively simple to do. You stop using the toilet for a few days, then encourage the worms into one corner of the tank with some tasty food scraps. You’re then free to remove some of the compost. Though, as I mentioned above, Anna Edey has been running hers for over 20 years and has never had to remove compost. Again, the “greenfilter” is not a lifeless leach field but a living system. You size it according to the number of people using the system and the amount of water it has to handle. You grow things that will use the water, so it’s not just sitting there building up. The soil biota maintain the bed in an aerobic state, just as they do in the worm tank (and as they do in any good healthy soil), so there’s no smell at all. My system handles black water only. Grey water goes elsewhere. The amount of water is pretty minimal – between 10 and 20 litres per day. Indeed, after the absence of winter rains and the very dry summer we’ve had, I’ve had to water the lemon tree on a couple of occasions. This is a natural system that’s built the soils on this planet since before humankind was around. It’s vastly superior to anything we’ve been able to devise with our hopelessly linear thinking. If you really want to go into the science, try this paper. What a Great! Discussion, I’m soooo glad I came across this, I’ll definitely look into Anna’s book. I’ve been reading lots lately on the many uses of Biochar, has anyone here ever integrated Biochar into this system? I’m no expert so I’m just “assuming” might help to reduce any odors at the initial stages, purify further water coming into the “green bed” ? any thoughts ?? Thinking aloud here, would guess a layer at top to keep odors down and layer at bottom to help purify water, perhaps even mixed in with woodshavings? My understanding is Biochar creates a 5star condo for microorganisms which would be helping worms in the breakdown of material. Hi Carlos. Yes you can mix biochar into the system. It’s not necessary because there are no odours but I’m sure it will add to the quality of the compost. Rather than making layers of it, I’d personally just mix it up with the woodshavings, bracken and leaves and I’ve been planning to do it for at least the last 2 additions but it’s gone out of my head in the moment. I don’t make biochar specially, but use any charcoal remaining after running the woodstoves (which otherwise goes into the compost heaps). I’m wondering if you have a filter substance at the bottom to keep sludge from clogging the exit pipe? Or is that not necessary? There is a piece of nylon mesh across the pipe exit, but that’s only to stop wood shavings from washing into the pipe. There is no sludge. This is a living system. It behaves completely differently to an inanimate filtration system. Please see my response to Pedro Henrique above as it already covers this subject. Thank you so much for posting all of the information that you have here, and for continuing to update. At some point, could you please make a diagram of the installation? The photos are excellent, but I didn’t know until reading your comments that there was nylon mesh over the exit pipe. A diagram with labels for the different parts you incorporated would help, because I think more and more of us will be trying to emulate you and Ms. Edey. I am ordering 2 copies of her books, so I can loan one of my copies of each to others who are interested in this without risking my own copy! Keep up the great work and please, please keep updating the progress! The longer that these systems survive such different climates as Portugal and Massachusetts, the more legitimacy they’ll have when we try to get permits for building them elsewhere (like in Virginia, 4 hours south of Washington, DC). Looking forward to seeing more! You’re inspiring us all! Thanks Sadb. Diagrams take a lot of time, unfortunately. Time I don’t have much of. I may do a step-by-step photo series to show the installation more clearly as I’ll be running a workshop on this in the near future and will need to produce accompanying materials. You might like to know that my local council have installed their first vermicomposting system modelled on mine in a nearby village for an elderly couple who’s septic tank was failing. I oversaw the installation, along with a local architect. 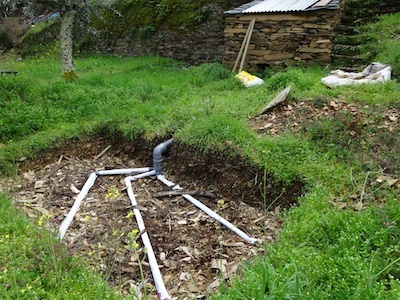 We are both now promoting the system here in Central Portugal as existing legislation is flexible enough to allow for vermicomposting systems like this under the specification of ‘septic tank with drainage’ in planning applications. More details as they become available. This is exactly what I’ve been searching for. I’m in Australia and the only commercial systems here are way over my budget, very complicated and can only be maintained by the company that supplies them, and on top of this they all seem to have a reputation for failure. Oh that’s great to know Suzi! Though it’s Anna Edey’s model ultimately so she should get the credit. And also very interesting to hear about the commercial systems available your side of the planet – when I was researching the subject it seemed the vermicomposting sewerage treatment model is further developed in Australia and New Zealand than anywhere else, but I also thought the systems I saw online ridiculously overcomplicated and expensive and didn’t know about the maintenance side of things. Aside from the obvious overcomplexity, do you know how and why they fail? I read through as many reviews as I could find and it seems the main issues were blockages, flooding and pump failures. Apparently the pumps couldn’t be upgraded because of lack of space and the blockages and flooding issues caused major problems as normal plumbers didn’t want to have anything to do with the systems and customer service from the original suppliers was reluctant at best. From what I read a lot of people changed back to ordinary septic systems. Interesting! It sounds like the system design I saw with a tank in the base to collect the water. I did wonder why they did that and think about all the problems it could cause. Thanks for letting me know! There was an update posted back in November (see above) but the system continues to work very well. I had a small incident in December when the tank started to fill with water. I unknowingly knocked the filter mesh out of place when scooping out some worms to start another tank going and some organic material got past it and blocked the outlet. I realised something was wrong when I could hear water falling on water in the tank after flushing. Fortunately some drainage was still happening so the worms were OK, if a little stressed. I cleared the blockage, added some fresh organic material and all is well again. There is now a separate website devoted to this system, complete with construction diagrams, maintenance instructions, the science behind it, a forum to exchange experiences as an open source community, and a project database which I hope will come to feature as many installations as I can get people to submit. 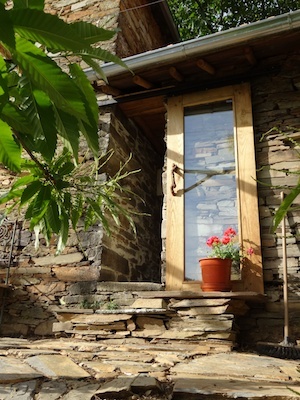 We have just bought a house in Portugal,which has a composting toilet. Would tiger worms help with the breaking down of matter. We are new to this and would greatly appreciate your support. Congratulations and welcome to Portugal. What type of composting toilet do you have? It all depends on that. Thanks for your reply “Quinta do Vale”. Our estate agent has informed me that it was just something the owner had fitted in . Nothing special Just a Toilet seat a shute. There is a sealed door on ground level. 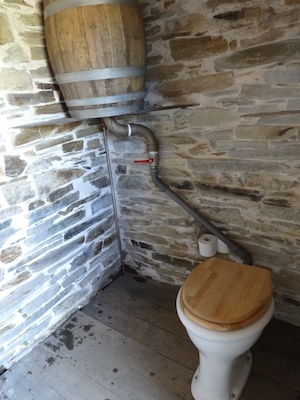 We have been using a bucket and a urinal for a pee.and placing sawdust when we use the shute. Any help is greatfully recieved. So it’s some sort of drop toilet? With the toilet on the first floor and a composting area below? Worms would certainly help with the processing of the waste. There may even be potential to convert it to a vermicomposting flush toilet if there’s room below for an IBC tank and you have a water supply for a flush toilet. There’s now a separate website devoted to the system I put in here at Quinta do Vale with full details for construction and maintenance. I’m really keen to use a system like this, my problem is that there isn’t room under the house for the IBC tank. Is there any way to work around this? I’m concerned that if i dig the tank in then the drainage will be too deep. Hi Suzi. Without seeing your site, or at least knowing a lot more about it, it’s almost impossible to advise. Is this a new installation or a retrofit to an existing system? What floor is the toilet on? It doesn’t have to be an IBC tank. Any watertight container with an appropriate volume and surface area for the number of people using the toilet will do. Guessing you’re in Australia? Had to Google besser blocks … Concrete block sizes vary a lot depending on where you are so how high is the container above the ground?